The Kansas City Royals announced three additions to the club's 40-man roster on Tuesday in advance of that day's deadline to protect players from the Rule 5 Draft, which will be held next month during Baseball's Winter Meetings. 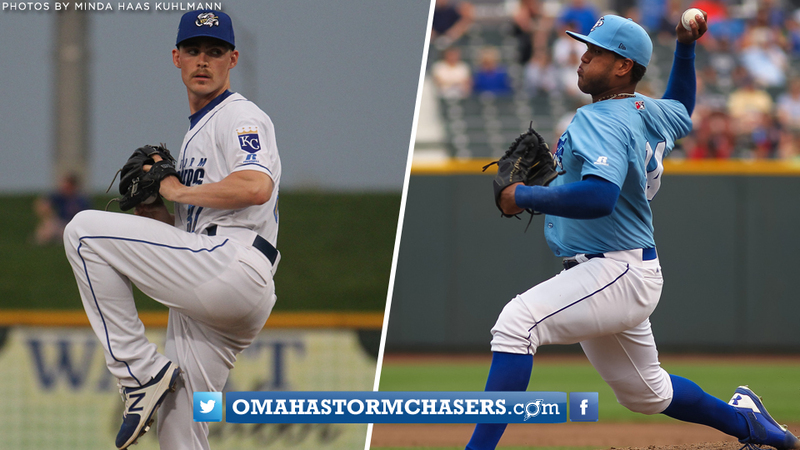 2017-18 Omaha right-handers Josh Staumont and Arnaldo Hernandez were both placed on Kansas City's 40-man roster for the first time, in addition to right-hander Scott Blewett . Over two seasons with the Storm Chasers, Staumont in 57 appearances (20 starts) has compiled a 5-13 record and 4.91 ERA (82 ER/150.1 IP), adding 196 strikeouts. His 103 punchouts in 2018 paced the club. Twice during the 2017 campaign he accrued 12 strikeouts in a game, matching the franchise's single-game record in the Werner Park Era (since 2011). Staumont was a Royals Spring Training non-roster invitee prior to the 2018 season, and was ranked the fourth-best prospect in the Royals system by Baseball America, in addition to being rated as having the "Best Curveball" in the organization. The 24-year-old was selected by Kansas City in the second round of the 2015 MLB Draft out of Azusa Pacific University in California. In 12 outings (11 starts) for Omaha between 2017-18, Hernandez has posted a 6-1 mark and 3.28 ERA (25 ER/68.2 IP) along with 42 strikeouts. That included a nine-innning complete game victory in which he fired 97 pitches, including 80 strikes, on August 15, 2018 versus the Oklahoma City Dodgers, becoming the first Storm Chasers pitcher to hurl a nine-inning complete game since Aaron Brooks in 2014. Over ten appearances (nine starts) this past season, Hernandez tallied a 5-1 record and 3.55 ERA (23 ER/58.1 IP), adding 36 strikeouts. The 22-year-old impressed in 2018, combining for a 12-5 clip and 3.96 ERA (61 ER/138.2 IP), with his 12 wins tied for the most among Royals minor league pitchers. He was signed by the Royals as a non-drafted free agent on September 18, 2012 out of Venezuela. Blewett pitched the entire 2018 season with Double-A Northwest Arkansas, accumulating an 8-6 mark and 4.79 ERA (79 ER/148.1 IP) with 100 strikeouts in 26 appearances, all but one of which were starts. He ended his campaign on a strong note, compiling a 3-0 record and 2.59 ERA (12 ER/41.2 IP) with 27 strikeouts over his final six outings, which included a nine-inning complete game victory on August 10 versus Frisco. A 2018 Texas League Mid-Season All-Star, Blewett ranked second in the circuit in innings pitched, in addition to fourth in baserunners per nine innings (13.69), fifth in batting average against (.282) and tied for sixth in earned-run average (4.79). He was selected by the Royals in the second round of the 2014 MLB Draft out of C.W. Baker High School in New York. Baseball's Rule 5 Draft will be held on the final day of the Winter Meetings on December 13 in Las Vegas. Players who were drafted in 2014, in addition to international players who were signed as non-drafted free agents in 2013, who are not on a club's 40-man roster are eligible to be selected.